Arriving in a new town, Houdini would claim the ability to escape from any handcuffs provided by the local police. His easy escapes provided excellent publicity for his shows. Houdini offered $100 to anyone who provided handcuffs from which he could not escape, but he never had to pay. Through his increasingly complex escapes and his shrewd use of publicity, Houdini became a headliner on the vaudeville circuit, playing in cities across the country. Not satisfied with that low level of fame, however, Houdini decided to gamble by taking his act to Europe. When he returned from Europe, Houdini performed increasingly high-profile stunts -- e.g., freeing himself from chains after jumping into Boston’s Charles River, escaping from a strait jacket while hanging upside down in Times Square, breaking out of a prison cell that held the assassin of President James Garfield. Today, we have Houdini performing a more straightforward escape -- from a simple chair and rope. 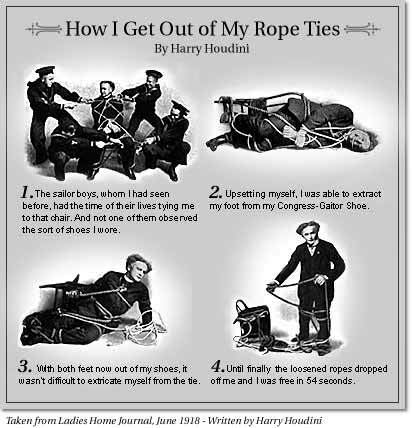 Below, in an image appearing in Ladies' Home Journal (1918), Houdini tells you a little about how he made his great rope escape. He offers more details here. The video above was shot circa 1920.